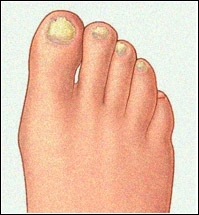 Onychomycosis is a fungal infection of the toenails or fingernails. This ailment causes fingernails or toenails to thicken, discolor, disfigure, and split. W ithout treatment, the toenails can become abnormally thick forcing the toe to press against the inside of the shoes, causing pressure, irritation, and pain. If the disease continues to progress without treatment, onychomycosis may interfere with standing, walking, and exercising. Onychomycosis is easily identified by its appearance. However, there are similar conditions and infections that can cause the nails to host a similar appearance to onychomycosis. Treatment options vary by individual and severity of the ailment. Talk with your podiatrist about what treatments will work best for you. Call us today to schedule an appointment.